You can bridge the amp to 3-channel mode to power them with 140 watts RMS each while driving your sub with 500 watts RMS. 1 X JBL CLUB-4505 CAR AMPLIFIER. JBL Club Series Club-4505. Speaker-level inputs allow this amplifier to integrate into almost any system, even one using your car's factory radio. Pioneer chipset, repair manual included! V12 705 3800 Watt 12V RMS 4 CH Channel Car Audio Power Stereo Amplifier Amp 4ohm. 3800W Watt 2 Channel Car Audio Power Amplifier Bass Amp For Subwoofer 12V DC. 6" 350W Car Subwoofer Amplifier Speaker Sub Woofer Box Powerful Audio Bass Amp. Rugged build quality and design make this amp an obvious winner in reliability and practicality. 2 Ohm Stable. Bass Boost Circuitry. 1 x 350 Watt RMS @ 4 Ohm. 1 x 1250 Watt Peak @ 4 Ohm. 1 x 900 Watt RMS @ 2 Ohm. Fli Trap FT12A 12" Active Subwoofer enclosure. The eye-catching design of the FLI enclosure range is sure to turn heads. From the unique amplifier heatsink to the smooth, sleek curves and stitched detail of the box itself, they not only look good but sound incredible. Everything is in perfect working order, only reason for sale is we have upgraded to the latest system. Condition is Used. Th e ba ss r em ot e se ll s fo r £5 0 on i ts o wn a nd t he amp is worth ov er £ 50 0. Genesis Series 3 Miniblock audio car amplifier 1 channel 1 omh. Condition is Used. Dispatched with Royal Mail 2nd Class. Very rare and only a few around Massive power!! RMS Out @4ohm stereo: 4 x 110 w. RMS Out @2ohm stereo: 4 x 150 w. This state of the art micro amplifier is part of VIBE Audio’s Supercar Series. RMS Out @4ohm bridged: 2 x 250 w. 4-channel Amplifier (bridgeable into 2 or 3 channels). 1 x Stereo Amplifier. The Signal Level: 220MV 47K. Frequency Response: 20Hz ~ 20kHz. 1 x User Manual. Sensitivity: 0.25mv-50mv. Product Weight: 207 G / 7.30 Ounces. Color: Red. Material: Lightweight Aluminum. I bought to fit myself just never got round to it. 1 x 3000W Max @ 2 OHMS. Rugged build quality and design make this amp an obvious winner in reliability and practicality. 2 Ohm Stable. PA Subwoofer & Midbass. Sold As: Single. Power and Protection LED Indicators. Dynaudio Passat B6 Lear High End AMPLIFIER. Condition is Used. Dispatched with Royal Mail 1st Class. Removed from Passat B6 SEL with Dynaudio upgrade installed. RX8 RADIO AMPLIFIER. May fit other years/models, your responsibility to verify if it is the correct part for you. When the RBC-1 is connected to the above amplifiers, it acts as an attenuator on the input gain of the amplifier and is used to adjust the overall level of the amplifier from the front of the vehicle. 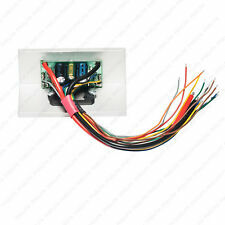 Type: 4-Pin Wire Harness AMP Amplifier Speaker Input Plug. -Used to put speaker level inputs to your amplifier when you don't have RCA'S. 1Pc x 4-pin harness plug. Number of Pins : 4 Pin. 4 Channel high to low level convertor. 2 channel to 4 channel hi to lowe level converter allows the use of a RCA cable to an amplifier with a radio that has no pre-outs and only speaker cables as standard. BT (N. Ireland), IM (Isle of Man), JE (Jersey), GY (Guernsey), PO (Isle of Wight), ZE (Shetlands). This does not affect your statutory rights. Includes 1 Year Manufacturers Warranty. Crossover Type Variable LPF. Bassface DB2.1 200w amplifier, never used in a car was used at work for 2 days on a speaker wall. No box. Model Number: HTG888. These are the back bones to all of our Lanzar Product 2012 line up. Our Optidrive line of products have been key choice of db drag professionals worldwide. At Lanzar, we don't need to compromise. Hi-end, SQ 2ch amp made in Taiwan. Test Certificate signed. by G. so you know :D.
65129330057 BMW F30 328i Amplifier For Harman Kardon. BMW F30 328i Amplifier For Harman Kardon. BLUE Illumination. Electronic Polarity Protection Circuit. Auto On/Off Four Digit Display. Installation Hardware Included. Up For Sale is a Used 02-08 BMW 7 SERIES AMPLIFIER AMP 65.12-6 941 681 OEM 656437639825 BECKER OEM. Up For Sale is a Used 06-10 Lexus GS350 GS430 Amplifier 86280-0W330 Mark Levinson Audio Radio Amp. 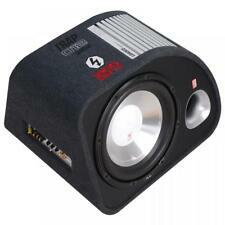 20W Mini Digital Audio Sound Amplifier For Speakers ONLY:19.99 EUR. Specifications:Out Power: 20W max R.M.S 10w. Mini Hi-Fi Stereo Amplifier for cars, motorcycles, boats or home. Mono subwoofer amplifier — 500 watts RMS x 1 at 2 ohms. Lightning Audio makes a great line of amplifiers that'll appeal to car audio fans everywhere. Their compact LA-1000MDMINI mono amp will hit your subs with up to 500 watts RMS, giving your sound a strong foundation. Part Number: TA3401. Local pickup is available for free. The Class D amplifier design ensures the amp's high output won't put any strain your vehicle's electrical system. JBL Club Series CLUB-5501 Class D Monoblock Amplifier. 1 X JBL CLUB-5501 CAR AMPLIFIER. Every GTR amplifier, including the full-range models, is a Class D. Class D amplification - Every GTR amplifier, including the full-range models, is a Class D. Upgradable firmware - GTR amplifiers incorporate a mini-USB port that enables you to easily upgrade firmware. 1 X ROCKFORD FOSGATE PUNCH PBR300X1 AMPLIFIER. PBR300X1- 300 Watt Amplifier with Boosted Rail Technology. In addition, this patented technology allows the chassis design to be much smaller than traditional sized amplifier - 1.53" x 4.25" x 6.75" - making this amp a great solution for smaller stealth installations, motorcycles and recreational vehicles. 1 X ROCKFORD FOSGATE PUNCH PBR300X4 AMPLIFIER. In addition, this patented technology allows the chassis design to be much smaller than traditional sized amplifier - 1.53" x 4.25" x 6.75" - making this amp a great solution for smaller stealth installations, motorcycles and recreational vehicles. PART# 65.12-6 933 875 (65126933875). I CUT THE WIRE HARNESS TO KEEP THE FACTORY CONNECTORS UNCOMPROMISED. I'M NOT A DISMANTLER. (LINE AND SPEAKER LEVEL INPUTS. INPUT SENSITIVITY SELECTOR. 4) All products sold are GENUINE UK products bought direct from manufacturers. POWER AND PROTECTION LEDS. VARIABLE LOW PASS CROSSOVER. 0 TO 18dB VARIABLE BASS BOOST. VIBE PULSE-2, 2-CHANNEL CAR AMPLIFIER - BRIDGEABLE MONO. AUTOSENSE: High level input with Autosense allows the amplifier to turn on and off without the need for a separate remote turn on wire. RMS @ 4Ω Mono (14.4v 1% THD): 1 x 150 watts. Model Number: PB715X. Two Channel Bridgeable Amplification. 1000 Watts Total System Output @ 4 Ohms. 2 X500 Watts Total Output @ 4 Ohms. Wax Sealants, Rust Protection. Sold As: Single. Towing & Trailer. (4-CHANNEL RIOT SERIES MOSFET POWER AMPLIFIER. LINE AND SPEAKER LEVEL INPUTS. INPUT SENSITIVITY SELECTOR. 4) All products sold are GENUINE UK products bought direct from manufacturers. POWER AND PROTECTION LEDS.